I was at this one hypermarket yesterday and came across this banner which was full of errors. Mr. Grammar Policeman was very happy indeed. I could detect four errors. What about you? Spelling errors for the words "MAINTENANCE", "WE'RE" and "INCONVENIENCE". 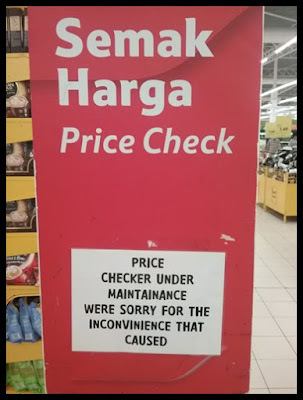 The last part of the sentence should read: "We're sorry for the inconvenience caused". And there should be full stops/periods (American) to separate the two sentences.